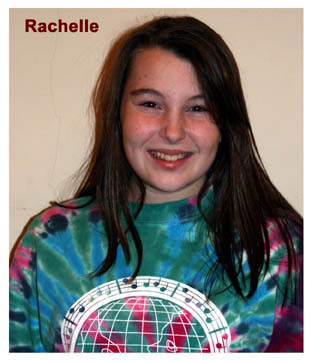 Ledyard - Singing in front of a large audience is no sweat for 13-year-old Rachelle Seney, since she has been “singing for as long as she could talk,” according to her mother, Jeanne. So, when Seney was chosen by a group of judges to sing with the cast of “Brooklyn the Musical,” one of the longest-running Broadway shows of the season, Seney sang her heart out. Voices for Hope is a partnership administered by the Local United Network to Combat Hunger (LUNCH) in Mystic and New Generations Ministries in Hartford. Both groups merged with “Brooklyn the Musical” and the Bushnell in Hartford to help raise money to fight hunger and homelessness. Entrants paid $50 and submitted a tape or CD demo recording. The money collected from the entrants will be used as funds toward local area organizations, including the Covenant Shelter of New London, the Harvest Home in Westerly, the New Generations' food pantry and breakfast program and the Katie Blair House in Norwich. According to Bill Pere, founder and executive director of LUNCH, approximately $3,000 was raised in a three-week period for the cause. “There were 52 entries, from as far away as New Jersey and Texas,” Pere said. Pere also said that the organizations plan on doing another contest in the future, with different formats, organizations and prizes. “We try to keep this as an experience, and that whatever happens, happens,” said Seney's mom, Jeanne. The judging for the competition was a three-tier process, with all contestants judged first by local music leaders. Twenty-five semifinalists were then narrowed down to 15 by the director of “Brooklyn,” Jeff Calhoun, music supervisor John McDaniel, and local gospel singer DJ, Jason Norfleet. The 15 finalists gave a live performance at the Bushnell in front of Pere and his wife, Kay, as well as an agent from New York and L.A.'s top talent agencies in early June. “I was called back that afternoon,” Seney said after her live performance in front of the judges. Seney, and seven other winners and two alternates were chosen, each having the opportunity to sing with the cast of “Brooklyn” on separate nights between June 20 and June 25. As far as Seney's future, she hopes to perform on Broadway again or become a chorus director. “I want to do something where I would go 'Woooo!' or have fun and be someone else,” Seney said with a laugh. This fall, Seney will be a freshman and member of the concert choir at Ledyard High School. She will also be recording a few special songs with the other finalists for a Voices for Hope compilation CD, set to release next year. For more information on Voices for Hope, visit www.lunchensemble.com or www.brooklynthemusical.com.